Rosebank self-catering holiday cottage is located in the pretty unspoilt village of Port Logan in the Rhins of Galloway, Dumfries and Galloway. 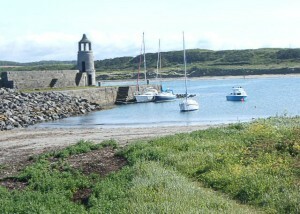 Port Logan has a stunning sandy beach, picturesque harbour and an old lighthouse. The beach is a few yards from Rosebank and is a haven for children to play safely and is every dogs dream! Port Logan Beach is popular for rock and beach fishing. For the boat owner Port Logan has a slipway making launching quick and easy. Fishing trip and pleasure trips can be arranged locally. 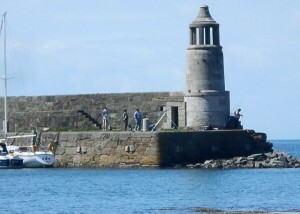 The village of Port Logan was used as the setting for the popular BBC Drama “2000 Acres of sky”. There is so much to see and do in South West Scotland and this quiet corner of Dumfries and Galloway has something to offer everyone. Whether you are a keen golfer, you enjoy walking, bird watching or you just want to enjoy your holiday and relax there’s something here in Port Logan and the Rhins of Galloway for you. There are so many opportunities for fishing in the Rhins of Galloway with fishing from the rocks or from the harbour side by Port Logan Lighthouse to heading out to sea on a fishing charter. Boat trips are available in nearby Portpatrick or Stranraer and you can join in with a full days fishing trip, head out for a pleasure cruise or take a thrill ride out on a fast rib. There is fly fishing at Dunskey, Portpatrick with tuition available. For keen golfers there are many Golf Courses close to Rosebank Holiday Cottage. Portpatrick, Dunskey Golf Course has two superbly maintained courses, an 18 hole and a 9 hole. Both courses have amazing sea views and the club has a PGA professional available for coaching and advice. Stranraer Golf Club has an 18 hole course and is located on the shore of Loch Ryan, visitors are welcome and there is a two storey clubhouse with views over the course and Loch Ryan. At Glenluce there is one of the region’s most popular golf courses, Wigtownshire County Golf Club. This is an 18 hole links course on the shores of Luce Bay. Game shooting can be arranged, please mention this at the time of booking your holiday at Rosebank. Pony Trekking and horse riding is at available Lochnaw, a short drive away and Terally Equestrian Centre is just on the edge of the village. We have world Class Mountain biking at Kirroughtree and Glentrool in the Galloway forest suitable for all ages and abilities. We have six beautiful gardens in the Rhins of Galloway, all within easy reach of Rosebank Holiday Cottage. You can easily visit all six gardens during your holiday and the garden passport gives you 10% off admission charges. Logan Botanic Garden is right on our doorstep and is Scotland’s most exotic garden and here tropical plants and ferns grow warmed by the mild climate from the Gulf Stream. Soleburn Garden Centre at Kirkcolm is well worth a visit and here you can browse the well-stocked gift shop and purchase various plants, trees and shrubs to take home with you. There’s also a wonderful coffee shop at the garden centre to enjoy delicious coffee and cakes. Aldouran wetland garden at Leswalt is home to the red squirrels and lots of other wildlife. 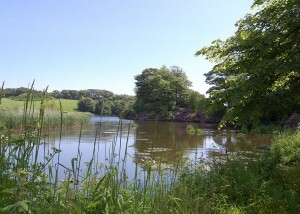 Visit the community garden, bird hide and the woodland walks. The Mull of Galloway is Scotland’s most southerly point with amazing views of Scotland and the Galloway Hills, Isle of Man, Cumbria and Ireland. From Easter until the end of October the Mull of Galloway Lighthouse is open to visitors and you can climb the 115 steps to the lantern room at the top. There is an exhibition of lighthouse history open daily from Easter until the end of October. The Mull of Galloway is an RSPB reserve and SSSI and you can see live camera footage of nesting birds on the cliffs in the visitor centre and enjoy guided walks each Tuesday and Thursday during the season at 1pm. 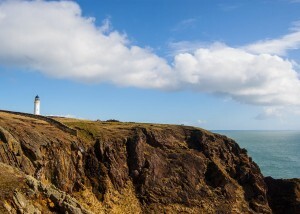 Gallie Craig is Scotland’s most southerly coffee house and is located at the Mull of Galloway. Logan Fish Pond Marine Life Centre is a short stroll along the beach from Rosebank Holiday Cottage. This is a unique visitor attraction with an opportunity to see some of Scotland’s marine life and geology. Agnew Park in Stranraer is a great day out for the children. Here you will find a miniature railway which takes you on a full tour of the park, a play park, an 18-hole putting green and a mini car racing circuit. The park is right by the sea and there are walkways and gardens to enjoy. Tigh-Na-Mara in Sandhead serves lunch with light bite options and dinner with a la carte and seasonal specials available. Torrs Warren Country House in Stoneykirk has two comfortable bars, a conservatory restaurant and an oak lined dining room. They serve fresh Scottish produce in season, fine wines and a wide range of malt whiskies. Clashwhannon in Drummore serves locally sourced food in the dining room and has a bar serving real ales. Blue Peter Hotel in Kirkcolm serves home cooked meals using locally sourced produce. The lounge has a cosy log burner and real ales are available. 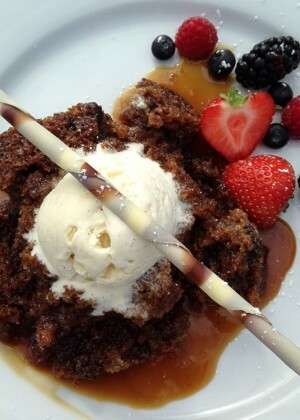 Campbell’s Restaurant by the harbour in Portpatrick has an extensive a la carte menu offering a range of house specialities, including seafood and meat dishes. Catch of the day is a real treat. Fernhill in Portpatrick has a stunning sea view across Portpatrick from its elevated position. Here you can enjoy the views whilst tucking into a delicious lunch, evening meal or afternoon tea. On a Sunday they serve a 3 course Sunday lunch. If you fancy coffee and cakes or afternoon tea then try the Potting Shed Bistro at Logan Botanic Garden, Woodlea Tearoom in Sandhead, Gallie Craig at the Mull of Galloway, Coffee Bean at Soleburn Garden Centre or the Beachcomber in Portpatrick. If you fancy a trip further afield take a ferry from Cairnryan to visit Belfast for a day trip, the short crossing only takes 2 hours and 15 minutes. There are often special prices for tickets and regular buses and taxis run from Belfast Port into the city centre. Visit the Titanic Museum, take a trip to Belfast Zoo or head to the shops. or give us a call on 01776 707010. We look forward to sharing Port Logan and the Rhins of Galloway with you.